Genealogy,Download family tree,GEDCOM,Family tree builder,family tree,printable family tree chart,Pedigree chart,family tree template,family tree maker,fy, build your family tree and add photos, historical records and more. 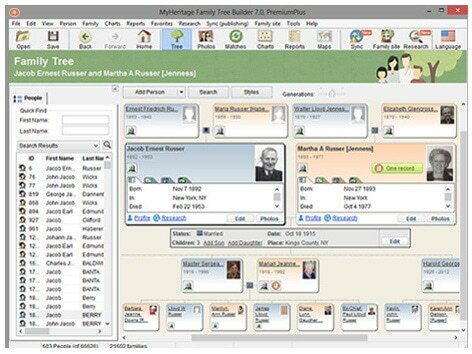 Powerful Family Tree Software - Build a family tree visually, add thousands of people quickly. Supports over 40 languages. Smart Matches Technology - Matches your tree to millions of others & discovers new relatives, automatically! Beautiful Charts - Create, customize and print beautiful charts and reports, even all-in-one charts. Record Matching Technology - Automatically discovers historical records of your ancestors. Private Family Site - Share your family history on your very own secure family site. Detailed Privacy Settings - Control every aspect of your privacy online and offline. Fun to Use - Easily import your GEDCOM file and continue building your tree. Maps - Discover where your ancestors came from, enhance your family tree. Sync with Mobile - Update your family tree on the go with our free mobile apps.